Girly attitude is something that make her feel proud in public . It’s considered without attitude a girly beauty is worthless. But these thoughts of attitude must be positive. 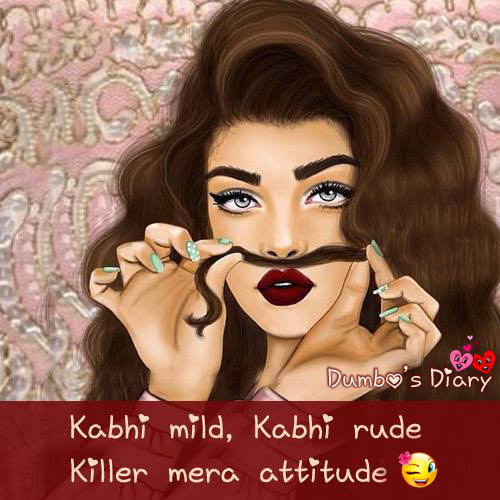 Here’s a funny quote about girly attitude as Kabhi mild kabhi rude…killer mera attitude. It’s a mixture of Urdu/Hindi and English words. Teen girls mostly like attitude quote in combination of Urdu/Hindi and English. Girls love to upload attitude statuses. These also considered as positive sayings. Here’s the quote edited over a picture of attitude girl.